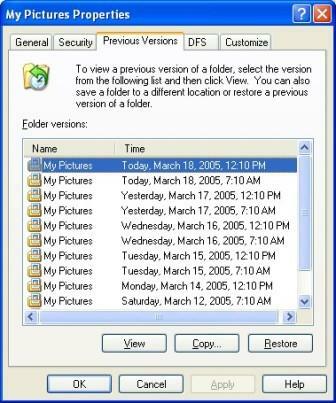 If you own Windows Vista Business, Enterprise, and Ultimate edition or all Windows 7 editions, or you may notice there is a Previous Versions tab for each files and folders. Previous Versions is a one of new system protection feature introduced in Windows Vista operating system and continue to exist in Windows 7 before been removed in Windows 8 (Previous Versions is re-added in Windows 10. Previous Versions is based on Volume Shadow Copy service (also known as Volume Snapshot Service or VSS) which allows Windows to take manual or automatic backup copies or snapshots of files and folders on a specific volumes or drivers at any point of time. Previously, Previous Versions was included in Windows 2003 as Shadow Copies for Shared Folders which can be utilized by Windows XP by installing a client software. Both functions automatically created incremental periodic snapshots or Deltas (differences) of changed files over time, allowing users to access, retrieve and restore the files as they existed at the point of time where the snapshot is taken. In other words, Previous Versions is a perfect feature to recover and get back any documents that you accidentally delete, or mistakenly modify or alter wrongly. Recycle Bin on the other hand does not give users such as flexibility and functionality. Recycle Bin only temporarily hold deleted files, where once you empty the Recycle Bin, all erased files are gone forever. With Previous Version, you can still recover these deleted files as long as your snapshots available is old enough so that the a backup existed for the state before you removed the files. Beside, Recycle Bin also does not provide any leverage against accidental modification of documents, spreadsheets, images and other files. Let’s imagine you make some changes to a document, and it’s a major changes, but only after finished the modification and saved then you notice that you either modify the wrong file, or suddenly been informed that no longer need to be modified, you’ll be totally stuck with just Recycle Bin without backup. There is no way for you to revert the changes, unless you’re using Previous Versions. With Previous Versions, users will get to see multiple versions of a file for a limited history (bounded by disk allocation size), and then able to restore, delete, or copy those versions. It will definitely save you a lot of time, especially when you belongs to someone who always in this kind of awkward situation.